A few months back I decided it was time to upgrade from my existing iPod Nano 2G to the newer iPod Nano 5G. The 2G Nano still worked, albeit with hiccups like the battery refusing to charge properly and limited capability when compared to the newest version of the Nano. So I went and replaced it with a new red Nano 5G. I had waited for a while after the 5G came out, figuring that any problems would be worked out and the necessary accessories, such as a case would be forthcoming quickly. Well, I was off a bit on the case issue and wound up utilizing my existing case for the 2G model (very carefully) as the 5G is just a tad bit longer than the 2G version. Marware was one of the first companies to come out with cases designed for the iPod Nano 5G. I’ve been lucky enough to give the SportShell Convertible for iPod Nano 5G and the Marware EcoRunner a really good workout. Starting with the SportShell Convertible, the way the case has been designed, it is actually three cases in one. It is a case designed to carry the iPod in an armband, in a clip case and in a pocket case. The unit is designed to utilize interchangeable parts, yet it is stylish and works great. Using the clip, you can attach your iPod to your belt, the armband or clip it to a pocket. If you don’t want to use it in this manner, take the back piece off, slide on the smooth back piece and stick it in your pocket. 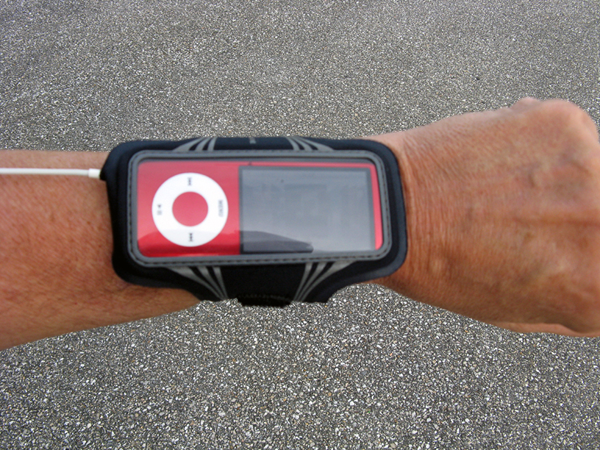 I gave the SportShell Convertible a thorough workout in the armband mode while exercising. Once in position on my arm, the SportShell did not move. It didn’t matter if I was running or doing weights, the armband stayed in place. 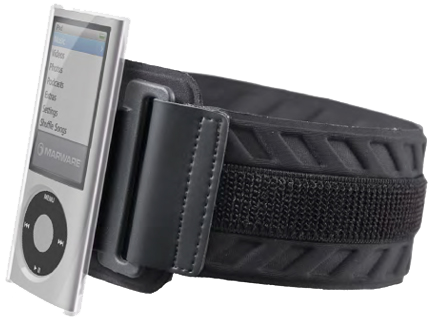 If I needed to, I could quickly remove the iPod off of the armband and clip it on my belt or waistband. If I was sitting and reading and didn’t want to disturb anyone else, I would normally just clip the iPod to my belt or pocket and enjoy the music while reading. By the way, the rear clip will lock in place allowing the iPod to stand up or lay on its side so you can enjoy viewing the videos you’ve recorded. The rear shell of the case is easily removed and you can replace the clip back with the smooth back and place your iPod in your pocket or just carry it around in your hand. The SportShell Convertible package includes the hard shell case, a clip, the armband, a clear screen protector, and a cleaning cloth. Design and style wise, the SportShell Convertible for iPod Nano 5G is great…If you are into running or working out and you need your iPod to motivate, consider Marware’s SportShell Convertible. Pro: Easy to use, good looking iPod case. My Mac rating: 8 out of 10. For those of you who are into utilizing products that are more environmentally friendly, you may want to take a look at the EcoRunner from Marware. Made from ecoprene (yes, I had to do some research to find out what it is… crushed calcium limestone that is described as being truly biodegradable) and rPET (recycled plastic, specifically PET (polyethylene terephthalate) that reduces the amount of hazardous substances in the product. 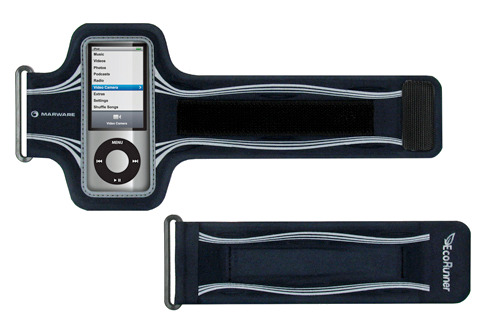 Unlike the SportShell, this iPod case is only usable in two ways – first as an armband or as a wristband iPod holder. The initial setup of the EcoRunner is as a wristband but it comes with an armband extension straps that allows you to configure it to your arm size. Good thinking on the design part. Overall, the ecoprene has a better feel to it than neoprene, at least it does to me. I gave both aspects of this case a total workout and while the armband performs flawlessly, I really became hooked on the wristband aspect. The one thing that always irked me a bit was running with an armband case and having a bit of difficulty in attempting to adjust the volume or switching to another artist or song. I usually had to stop to make my adjustments. Using the EcoRunner as a wristband case, that is no longer a problem. The iPod screen is now clearly visible and readily accessible. Having come into possession of a new mountain bike, I’ve found the wristband allows ease of use versus the armband while I’m riding. Now dependent upon the type of weight workout you may be doing, you may find the wristband too restrictive to use. Being able to switch over to the armband in that case is great. The EcoRunner package includes the wristband, armband extension, a clear screen protector and a cleaning cloth. Speaking of being more environmentally friendly, it’s nice to see the minimal use of plastic and cardboard in the packaging for both of these products. The package and its instructional contents are recyclable once your have your iPod case in use. Pro: Easy to use, good looking iPod case. Comes in Black, Blue or Pink colors. My Mac rating: 9 out of 10.